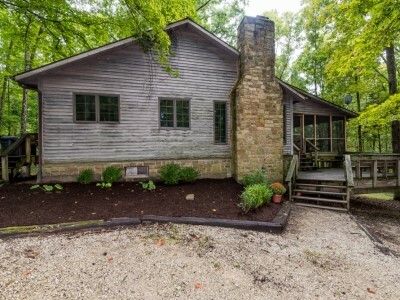 This large and comfortable home sits high on a hill and nestled in the woods of Brown County, offering peace and tranquility. The home has a screened in porch, deck and lots of outdoor space to hike or have an adventure. The main floor features a cozy living room with a stone, wood burning fireplace and futon for two guests. The attached dining area is next to the kitchen. The main level features a master suite with queen bed and private as well as a second bedroom with queen bed and another bathroom. Downstairs the family room will entertain guests with a pool table, gas fireplace and a sofa bed that will accommodate two guests. There are two additional bedrooms, one with a king bed and another with a queen bed. A full bathroom is located between the two bedrooms. The basement offers walk out access to the back yard. The large screened porch is the perfect spot to relax. Play cards at the table or just take a nap in the Adirondack chairs. The outdoor charcoal grill provides a great place to cook your favorite grilled foods. If you need additional space, guests can stay at the nearby Tree House located a quarter mile away, which accommodates to up 6 guests. Both are close to Yellowwood State Forest, 3.5 miles from Nashville and 5.5 miles from Brown County State Park.